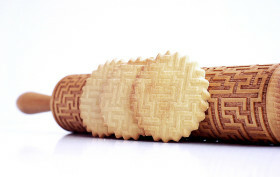 Why waste your time with sprinkles and icing when you can fancy up your cookies with nothing more than a rolling pin? These laser-engraved models from Valek are embossed with fun patterns like moustaches, deer, and swirly leaf motifs. There’s even miniature versions for the kids that feature dinosaurs or robots. With just a roll of the pin, your dough instantly becomes a piece of art.